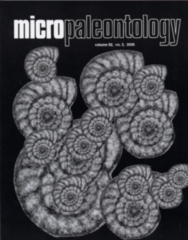 ABSTRACT: Paleoecologic interpretation of Cretaceous benthic foraminiferal assemblages is frequently problematic because of the lack of modern indicator species. Late Cretaceous (Cenomanian to Coniacian) assemblages of the Nkalagu area in southern Nigeria (Lower Benue Trough) were analyzed paleoecologically and compared with isochronous assemblages of the Upper Benue Trough (Futuk and Ashaka). The analyzed sections are forming a transect from near shore to oceanic environments and therefore represent paleocological gradients. Late Cenomanian assemblages of the Nkalagu area are continuously dominated by Ammobaculites spp. Diversity is constantly low and a dysoxic to suboxic, normal marine, inner shelf environment can be assumed for this section. The Middle Turonian to Coniacian Sections at Nkalagu yielded various arenaceous and calcareous species. The most common genera are: Ammobaculites, Flabellammina, Gabonita, Gavelinella, Haplophragmoides, Nonionella, Planulina, Praebulimina and Trochammina. Middle to early Late Turonian sediments atNkalagu were deposited at paleo-waterdepths of about 600 m, latest Turonian sediments at c. 250mand Coniacian sediments at c. 600 m. Latest Turonian assemblages indicate unstable, alternating oxygen-rich and oxygen depleted conditions (suboxic to low oxic), changing to more stable conditions in the Coniacian at Nkalagu. The successive deepening indicated by the foraminiferal assemblages documents a change of the depositional environment from inner shelf to upper bathyal in the lower portion of the Benue Trough during the Cenomanian to Coniacian interval. Inner shelf assemblages from the Upper Benue Trough (Futuk and Ashaka localities) vary between brackish and normal marine conditions. Ammobaculites, Haplophragmoides and Gavelinella are the most frequent genera at Futuk, while additional occurrences of Ammotium, Reophax and Saccammina are indicative for brackish conditions at Ashaka. The application of a canonical correspondence analysis (CCA), embracing assemblages from the entire Benue Trough, enables the separation of different depositional environments with partly similar species content. In the present case, CCA is able to distinguish between brackish and normal marine conditions among shallow water assemblages, and between shelf and bathyal depths among normal marine depositional environments. CCA might therefore be used in settings with largely endemic associations and/or without modern species for calibration of assemblages, such as the Cretaceous Benue Trough.